The ECG. The most common heart tracing is the 12 lead Electrocardiogram (ECG). All new patients and many follow up patients would have this test done. It gives your doctor invaluable information about your heart. It will usually be done in the consultation room by the doctor or a nurse. Ambulatory heart monitors. Often we wish to study your heart rhythm for 24 hours or more. In this situation our specialist cardiac technician will fit you with a monitor (a bit like a walkman stereo) to wear. We will usually ask you to keep a careful diary of your symptoms to see if they correlate to a disturbance in your heart rhythm. Common monitors we request include: 24 hour tapes, 48 hour tapes, 7 day tapes and patient activated event monitors. On occasions we may ask for you to have a small implantable recorder fitted, which involves a short procedure. These test results take some time to analyse and will not immediately be available, we will contact you in a few days when they are ready. 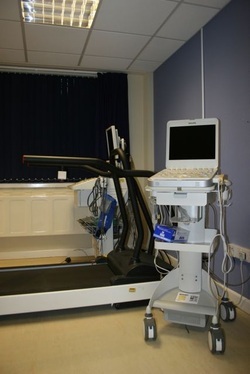 Exercise treadmill tests. These involve being wired up to a 12 lead ECG and blood pressure monitor and walking on a treadmill to assess the response of your heart to exercise. Although this is very rarely done in modern practice to assess the arteries that supply your heart it can be occasionally used for this and other conditions. You will be advised to bring a comfortable pair of trainers and wear comfortable loose fitting clothes to do this. 24 hour blood pressure monitor. To fully and accurately assess your blood pressure we will often request this test, which involves wearing a blood pressure cuff and monitor for 24 hours. These test results take some time to analyse and will not immediately be available, we will contact you in a few days when they are ready. Echocardiography involves using an ultrasound probe (similar to the type of scan pregnant ladies have to look at their baby) to study the structure and function of the heart in detail. This is a commonly performed test that most new patients would need when being seen for the first time. It is performed by a senior cardiac physiologist who is a highly trained technical expert that specialises in doing this test. Sometimes your consultant may perform this scan. Dr Rakhit and Dr Shah run this service and are our non-invasive imaging experts. The results of this test will usually be sent to the doctor who will see you in clinic and discuss them or write to you. Stress Echocardiography is a test which uses ultrasound of the heart combined with a stress test (either exercise of a drug infusion which simulates the effect of exercise) to determine the blood flow to areas of the heart muscle and the presence and extent of scar tissue within the heart muscle. It is a sophisticated investigation which requires a high level of expertise to perform and interpret the results. 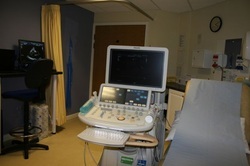 Wessex Cardiology has consultants who have not only a high level of expertise in this area but also an international reputation for stress echocardiography. If you are undergoing this investigation, you can download an information sheet below. Dr Rakhit and Dr Shah run this service and are our non-invasive imaging experts. The doctor will often give you your results the same day. The cardiologist looking after you will then either see you and explain the results and plan or write to you with this. Occasionally Echocardiography does not give us clear enough pictures or information to assess your heart. In these circumstances you may need to have Transoesophageal Echocardiography, which involves swallowing an ultrasound probe so that it sits extremely close to your heart and much more detailed/clear images can be obtained. This is undertaken as a day case procedure with lots of medication to make you feel very sleepy and relaxed (sedation). We have dedicated endoscopy facilities which are utilised for Transoesophageal Echocardiography. Wessex Cardiology consultants undertaking this procedure have an international reputation in the field of echocardiogaphy. Dr Rakhit and Dr Shah run this service and are our non-invasive imaging experts. ​ The doctor will often give you your results the same day. 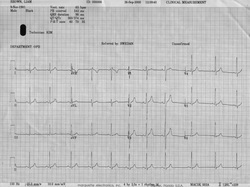 The cardiologist looking after you will then either see you and explain the results and plan or write to you with this. A coronary angiogram is a test done to look at the arteries that supply your heart. If is done under local anaesthetic and involves passing small tubes up to the heart via the wrist or leg. Often the doctor will give you some sedation to make you feel slepy and relaxed. Dye is injected into the arteries via these tubes and pictures taken, this enables doctors to look for narrowed segments, which may then need treating. Occasionally the doctor may plan to go on and treat a narrowing at the same time (see section below). However, if you have a complex narrowing they may choose to plan treating it at a later date as it may be safer. If you have a lot of narrowings then you may need to be referred for a bypass operation. 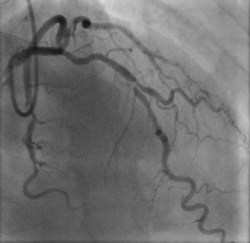 Coronary angiography is usually a day case procedure, this means you go home the same day. The doctor will usually give you your results and treatment plan on the same day. Although this test is commonly done and generally very safe there are some very serious potential risks and it is important you have it done by an experienced cardiologist who does it on a regular basis in the NHS as well as privately. This test is usually best done by an interventional cardiologist who performs it on a regular basis, unless you are having a specialist assessment for heart failure by Dr Cowburn. General patient information on Coronary Angiography is available on the British Heart Foundation website. Cardiac MRI scanning provides a safe way to get some highly detailed information about the structure and function of your heart (three examples of which can be seen below). It is completely safe as no x-rays are used. No need to be able to go in to a tight tunnel, if you are nervous about this or claustrophobic it is important you tell the doctor before as we can often give you medication to relax you. Dr Flett does MRI scanning, as do our highly experienced Cardiothoracic radiologists. These scans are complex and take quite some time to report after they have been done, so a report will be sent back to your consultant. The consultant cardiologist looking after you will then either see you and explain the results and plan or write to you with this.